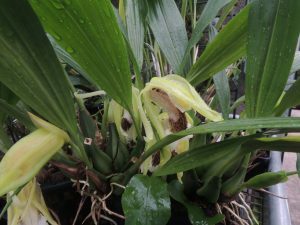 This coelogyne produces a succession of large flowers on short pendulous flower spikes from relatively compact plants. 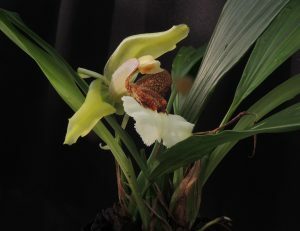 Coelogyne speciosum is native to Malaysia, Borneo, Java and Sumatra where it is reported from 700-2000m altitude. This variety has more white on the lip than is usual and a light green flower colour where the more usual colour is variations of yellow and brown. We keep the species well watered throughout the year. It produces the odd flower at anytime through the year but the main flowering is in the summer. The large hairy lip is well worth a close inspection. The species is probably pollinated by large bees.